Sea level rise is the chief pretext for alarm about Man’s influence on climate. Agencies such as the Intergovernmental Panel on Climate Change (IPCC, 1990-2013) have adopted an often unscientifically alarmist stance on the climate question, favouring extreme predictions both of future temperature change and of the consequences of global warming, especially sea-level rise. Those predictions have proven exaggerated. 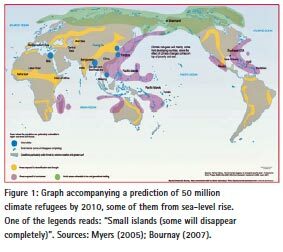 Earlier that year the Organization for Security and Cooperation in Europe had published a report by Professor Norman Myers, an environmentalist campaigner at Oxford University (Myers, 2005), predicting 50 million “climate refugees” by 2010. In 2007 the report was reproduced in the annual environmental atlas published by Le Monde Diplomatique (Bournay, 2007), with a map (Figure 1) that found its way on to the website of the UN Environment Program, one of the IPCC’s two sponsors. “If you leave us at 450ppm for long enough it will probably melt all the ice – that’s a sea rise of 75 metres. What we have found is that the target we have all been aiming for is a disaster – a guaranteed disaster.” Fortunately, science has now dismissed such extreme projections as mere rodomontade. For the sole mechanism by which the activities of Man might in theory raise sea level significantly is CO2-driven global warming. CO2 now occupies just 1/10,000 more of the atmosphere than in 1750. Every month the index of global temperature change, based on the RSS satellite global lower-troposphere temperature-anomaly dataset, shows the longest period ending in the present showing a zero the least-squares linearregression trend. The latest index (Monckton of Brenchley, 2014) shows no warming during the 18 years 1 month September 1996 to September 2014 – more than half the satellite record. 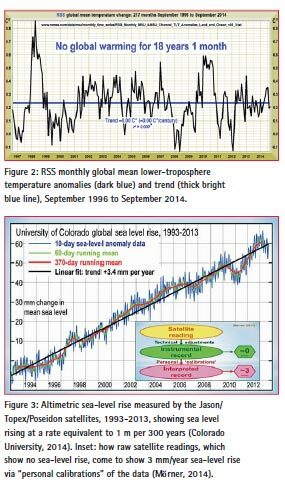 The mean of the GISS, HadCRUT4, NCDC, RSS and UAH global-temperature datasets shows no warming for 13 years. Accordingly, any sea-level rise that may have occurred over the past decade or so is unlikely to have been much influenced by our greenhouse-gas emissions. Since there has been no global warming this millennium, any sea-level rise since 2000 must have been caused either by some natural factor (such as increased activity among the 3.5 million subsea volcanoes most of which have never been visited or monitored) or by what Professor Niklas Mörner, the world’s pre-eminent sealevel expert, has described as “personal calibrations” by the recordkeepers (Mörner, 2011). Professor Mörner has contributed almost 600 papers to the scientific literature in a professorial career spanning almost half a century. It is arguable that the “personal calibrations” that he describes are the chief cause both of uncertainty in the sea-level data and of apparent sea-level rise itself. The “official” sea-level record (Colorado University, 2014) is based on altimetry from the Jason/Topex/ Poseidon satellite series. It purports to show a sea-level rise of 3.4 mm/ year, or approximately 1 ft/century (Figure 3). This rate of increase, stable throughout the period of satellite monitoring since 1993, is less alarming than the Myers and Hansen predictions. The “official” published rate of current sea-level rise, though it is well below the headline-grabbing extreme projections that have been made, may itself be an exaggeration. For tide gauges show sea level as having risen in recent decades at a rate of about 1.7 mm/year or 1 m in 600 years. That is half the satellite value. That lower rate shows no increase since 1900. 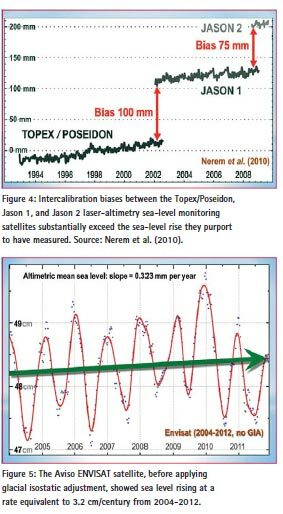 Furthermore, the (inevitably upward) intercalibration biases between the Topex/ Poseidon, Jason 1 and Jason 2 laseraltimetry sea-level monitoring satellites, at 175 mm, exceed twice the total sea-level rise the satellites have purported to measure. Two important independent satellite data series confirm the tide-gauge results and disagree with the “official” satellite series. 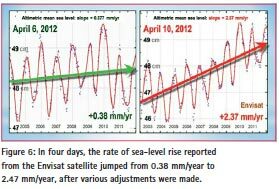 First, unadjusted data from the Aviso ENVISAT satellite, a $3.5 bn flagship EU project which operated from 2004 till it inexplicably failed in April 2012, showed sea level rising at a rate equivalent to only 3.2 cm (1.3 inches) per century (Figure 5). However, the ENVISAT record, like those of all other satellites, was subjected to (inevitably upward) revision arising from “personal calibrations” calculated to bring the data more closely into line with the “official” sea-level record (Figure 6). 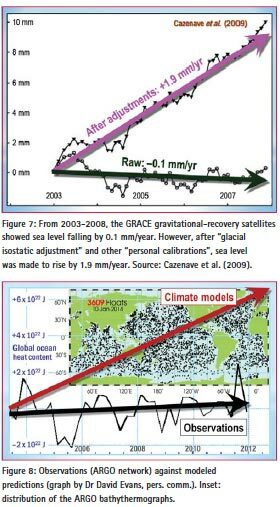 Secondly, the GRACE gravitationalanomaly satellites, perhaps the most accurate method of measuring sealevel change, also show little warming since 2001. However, again there were (inevitably upward) adjustments, this time to incorporate a “glacial isostatic adjustment” for the continuing slow rebound of the great land masses after the last Ice Age (Figure 7). Even after “personal calibrations”, the rate of sea-level rise shown by the GRACE satellites accords with the tide-gauges but not with the “official” sea-level record. Systemic sea-level rise is driven by melting land ice and thermosteric expansion. However, satellite altimetry shows that the volume of land-based ice in Antarctica has changed little in 35 years, for there has been little warming there, and that the Greenland ice mass increased substantially from 1993-2004 (Johannessen et al., 2005) and declined somewhat thereafter. Thermosteric expansion only occurs if the ocean warms. However, the 3500 automated ARGO bathythermograph buoys deployed throughout the world’s oceans show little increase in the heat content of the global ocean – one-sixth of what had been predicted (Figure 8). Furthermore, the failure of the atmosphere to warm this millennium is a powerful indication that the ocean to which it is coupled, three orders of magnitude denser, cannot have warmed appreciably: for if the ocean had warmed the atmosphere must have warmed too. One frequently-publicized explanation for the near-total yet near-totally unpredicted absence of global warming recently is that the coupled ocean-atmosphere system has continued to accumulate heat as models had predicted, but that recently the ocean has removed the heat from the atmosphere by the ocean. Since globally the near-surface strata show far less warming than predicted, it is hypothesized that the “missing heat” has traveled to the little-measured benthic strata below 2000 m, whence it may emerge one day. The ocean “missing heat” theory is chiefly advocated by a single group in the United States (Meehl et al., 2011; Balmaseda et al., 2013; Trenberth et al., 2014a), who say that during periods without global warming the ocean above 300 m takes up significantly less heat, whereas the ocean below 300 m takes up significantly more, compared with periods when warming is occurring, and that more than ninetenths of any overall “thermal imbalance” in the climate is expressed in a rise in ocean heat content. On this theory, global warming has not stopped: it is continuing, but not in the atmosphere. Instead, it is harmlessly accumulating in the deep ocean, from which it may one day reemerge, somewhat in defiance of the laws of thermodynamics, which prohibit the transfer of heat from a colder body to a warmer body with which it is in contact. To date, however, no empirical, theoretical or numerical method has plausibly specified a mechanism to explain either how the heat generated by anthropogenic greenhouse-gas enrichment of the atmosphere has reached the deep ocean without much altering the heat content of the intervening nearsurface strata or how the heat from the bottom of the ocean may re-emerge to perturb the near-surface climate conditions relevant to land-based life. Most ocean models erforming coupled general-circulation sensitivity analyses cannot resolve most of the physical processes for capturing heat uptake by the deep ocean. Ultimately, the second law of thermodynamics requires that any heat accumulated in the deep ocean will dissipate slowly and harmlessly by diffusion. It is not plausible that any heat taken up by the deep ocean will suddenly warm the upper ocean and, via the upper ocean, the atmosphere. Even if heat were reaching the benthic strata without warming the nearsurface strata on the way, the transient near-surface response has proven insensitive to rising atmospheric CO2. Furthermore, almost all current analyses of ocean heat content and budget lack an accurate accounting of spatial, temporal and other systematic errors and uncertainties (Cheng & Zhu, 2014; Cheng et al., 2014ab). The suggestion that sea-level-rise-inducing heat accumulation in the deep ocean explains the standstill in global warming is far from accepted. Many competing and often mutually exclusive explanations, chiefly involving near-surface phenomena, are offered: (1) coverage-induced cool bias in recent years (Cowtan & Way, 2014), rebutted by Fyfe et al., (2013) and, with respect to Arctic coverage, by Chung et al. (2013); (2) anthropogenic aerosols from coal-burning (Kaufmann et al., 2011), rebutted by Kühn et al. (2013) and Neely et al. (2013); (3) decline in the warming caused by black-carbon absorption (Neely et al., 2013); (4) emission of aerosol particulates by volcanic eruptions (Santer et al., 2014), rebutted by Heywood et al. (2014); (5) reduced solar activity (Stauning, 2014); (6) effectiveness of the Montreal Protocol in controlling emissions of chlorofluorocarbons (Estrada et al., 2013); (7) a lower-than-predicted increase in methane concentration (Estrada et al., 2013); (8) a decrease in stratospheric water vapor concentration (Solomon et al., 2010); (9) strengthened Pacific trade winds (England et al., 2014) (previously, Vecchi et al., 2006, had attributed weaker Pacific trade winds to anthropogenic global warming); (10) stadium waves in tropical Pacific circulation (Glaze et al., 2013); (11) coincidence (Schmidt et al., 2014); (12) aerosol particulates from pine-trees Ehn et al., 2014); (13) natural variability (Watanabe et al., 2014; Lovejoy, 2014); (14) cooler night-time temperatures in the Northern Hemisphere (Sillmann et al., 2014); (15) predictions by those models that allowed for the possibility of a pause in global warming Risbey et al., 2014; Guemas et al., 2013); (16) the negative phase of the Pacific Decadal Oscillation (Maher et al., 2014; Trenberth et al., 2014b; Dong & Zhou, 2014); (17) the Atlantic meridional overturning circulation (Schleussner et al., 2014); (18) global dimming following the global brightening of 1983-2001 (Rahimzadeh et al., 2014); (19) relative frequencies of distinct el Niño types (Banholzer & Donner, 2014); (20) surface cooling in the equatorial Pacific (Kosaka & Xie, 2013); (21) Pacific cooling amplified by Atlantic warming (McGregor et al., 2014); (22) a combination of factors, including ENSO variability, solar decline and stratospheric aerosols (Huber & Knutti, 2014); (23) underestimated anthropogenic aerosol forcing (Hansen et al., 2011); (24) a new form of multidecadal variability distinct from but related to the ocean oscillations (Maclas et al., 2014); and (25) failure to initialize most models in order to conform with observation, particularly of oceanic conditions (Meehl & Teng, 2014). Given the conflicting testimony as to the explanation for the long and unpredicted hiatus in global warming, it is impossible either to assign a single cause to the pause or to assume that the missing heat is in the deep ocean and will thus raise sea level at the high rates predicted by IPCC (2013). On the evidence, global temperature has not risen at all this millennium, so that there is no reason to expect any sea-level rise above the established, small and harmless long-term rate. It is difficult to discern any manmade contribution to sea-level rise in the raw data. Only in the “official” record, and then only after “personal calibrations”, does faster sealevel rise appear, and only then at the moment of the changeover from tidegauge to satellite-altimetry measurement in 1993. The acceleration may well be a mere artefact of the altered method of measurement. The notion that the absence of global warming this millennium is attributable to the accumulation of heat in the ocean is not demonstrable by sufficiently-resolved measurements and is in any event hotly contested in the climate journals. It is likely that sea level will rise over the coming century or two at a rate no greater than the 1 m per 600 years observed by tide-gauges since 1900. That rate is slow enough to allow ready and inexpensive adaptation almost everywhere. Lord Monckton was an expert reviewer for the IPCC’s Fifth Assessment Report (2013), and contributes papers on climate sensitivity and climate economics to the learned and specialist journals. Bournay E (2007) Atlas Environnement du Monde Diplomatique, Le Monde Diplomatique, Paris. Hansen J (2008) Climate target is not radical enough – study: The Guardian, London, April 7, http://www. theguardian.com/environment/2008/ apr/07/climatechange.carbonemissions: accessed October 2014. Monckton of Brenchley, CW (2014) It’s Official: Global Warming ‘Pause’ or Standstill extends to over 18 years: global temperature update, http:// www.climatedepot.com/2014/10/03/ its-official-global-warming-pauseor- standstill-extends-to-over-18- years-pause-has-endured-for-a-littleover- half-the-satellite-temperaturerecord: Accessed October 2014. Mörner NA (2011) Sea Level Is Not Rising, Centre for Democracy and Independence, London. Myers, N. (2005) Environmental refugees, an emergent security issue, 13th Economic Forum of the Organization for Security and Co-operation in Europe, Prague, May. Vecchi GA, Soden BJ, Wittenberg AT, Held IM, Leetmaa A, Harrison MJ (2006) Weakening of tropical Pacific atmospheric circulation due to anthropogenic forcing. Nature 441: 73-76. doi: 10.1039/nature04744.